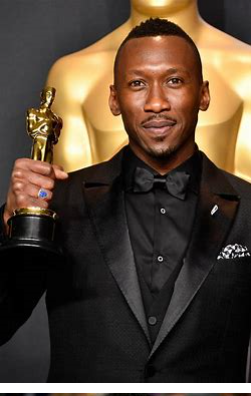 Oscar Winner Mahershala Ali is now being picked by a majority of my pundit colleagues as the probable winner of Best Supporting Actor for “The Green Book.” I know it’s early still, but his closest competitor is Timothee Chalament for “Beautiful Boy.” And Timothee is still very young ,and Mahershala is in the Oscar Honeymoon period, where it is still quite possible that he could get Oscar number Two for his tremendous portrayal of a real life person, pianist Don Shirley. This would tie him with Denzel Washington, for being the only two African-American actors, who have two Oscars. AND it’s a gay role. AND it’s a lead. Or co-lead. And yes, he shouldn’t be in the Supporting Category at all, but that’s what his film company is doing. They are running him in Supporting because as we’ve seen he could win there, and if he and fellow co-star Viggo Mortensen were BOTH in the Leading Actor category (as they should be), they would probably cancel each other out and neither would win. Mahershala when he was a student at NYU’s very much lauded Graduate Acting Program went by the name, Mahershala Karim Ali. I saw him in many student productions there, and as I said, he was always a stand-out and always accomplished. When he was graduating in 2000, I saw his Actor Presentation night. This is when the entire graduating class does a series of three minute scenes for the assembled masses of New York’s agents, managers and casting directors. I was privileged to have seen Mahershala do scenes from “Cowboy Mouth” by Sam Shepherd,”Angels in America: Part One, Millenium Approaches” by Tony Kushner, where he was partnered with the great Carson Elrod, and played the part of Belize, the sassy, smart male nurse, which kind of foreshadowed how well he was going to do with “Green Book”s demanding, commanding homosexual pianist. Don Shirley. Obviously, he totally aced that important night, which is something of a trial by fire and also a litmus test of the career that’s going to be awaiting all these talented students upon their graduation a few weeks hence. Clearly, he passed with flying colors.